There are so many volunteers behind the scene of any Tater Patch play. 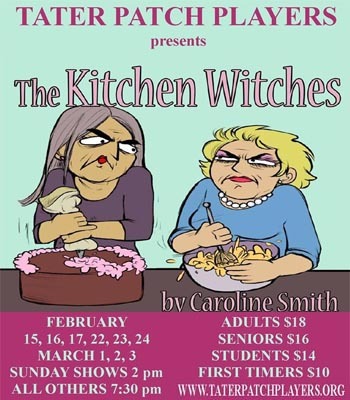 For The Kitchen Witches, by Caroline Smith, there's been hard work going on since just after Christmas. The set volunteers took down the really complicated set from A Christmas Story and immediately started building a TV studio type kitchen. Director Gary Boyles was very involved with the set design and has stayed involved every step of the way. He helped get Tater Patch the loan of real kitchen equipment from Jasper Appliances. Then he borrowed a real TV camera from ETC-3. He's come up with great ideas for all the food props in the show. A lot of the food is real and the backstage crew is busily planning what will appear and when, and where it will be stored when not on stage. But some of the food isn't so real, and intrepid invisible volunteers made spare ribs and beets and many other food "props". The costumes were chosen and some had to be altered. The lighting was designed and many sound effects were put together. One of the volunteers, Carlene Archer, wrote a "Kitchen Witches Theme Song" that will play during the "tv show". The front of house team has been getting the food and beverage inventory ready to sell to you, and volunteers have produced the playbills that the volunteer ushers will give you. Meanwhile, the four actresses in this show have been rehearsing and learning lines. And it's not just lines. There's a whole section of the show that is unscripted, as it represents a cooking competition that will feature actual food and a "celebrity judge" chosen from the audience. They have had to be prepare for whatever might be said or done by the judge, and to respond to which "witch" he might choose as the winner of the competition. So they've been practicing with unpredictable volunteer judges, too. Come see how funny a play can be. The "witches", played by Nancy Davis and Sharon Young, have been polishing their barbed zingers that they throw at one another. Meanwhile, Christin Evans, as the producer/daughter whose patience is tried at every turn is polishing her comic delivery. She's a veteran of Tater Patch who's returned after many years to delight you all. And finally, Shy Rain Owens is making her debut on stage as the camera operator, Robbie. She doesn't have many lines, but she's "on" a lot and worked hard perfecting her near-silent character. Come out and enjoy the set, the sounds, the lights, the props, the popcorn -- and most of all the performance of this hilarious cast. Gary Boyles has done himself and Tater Patch proud in his directing debut. Come enjoy all their efforts. The show dates are February 15, 16, 17, 22, 23, 24 and March 1, 2, 3. The Sunday shows are at 2PM and the others at 7:30 PM. Adult tickets are $18, Seniors $16, Students $14 and First Timers to our theater are only $10. All tickets may be reserved in advance at www.taterpatchplayers.org , or bought on show dates at the box office beginning one hour before curtain time. As always, Tater Patch gives back to the community by opening its February 14 dress rehearsal, at 7:30 PM, to members of the community who cannot afford tickets. The troupe asks that those attending this "Share Night" bring a bag or two of non-perishable food or toiletry items that will be shared with the CARES food pantry. Please address questions or comments to taterpatchplayers@gmail.com or leave a message at 706-253-2800.